The below content is also available in a fully accessible and easy to print PDF. This Guide to Pupil Accommodation Reviews is to help inform parents and guardians about the process that Ontario’s school boards undertake when reviewing whether to consolidate or close a school. For parents1 attachment to a local school may make the thought of change very difficult. Similarly, school closure decisions are often among the most challenging for school boards. Despite these challenges, school board trustees must focus on the educational needs of all of their students and the prudent distribution of resources to meet those needs. School boards are committed to community engagement, and when considering school consolidation or closure, they reach out to parents and the public for their input. This public consultation process is called a “pupil accommodation review.” This process is mandated by the Ministry of Education and must occur prior to a decision to close or consolidate a school. It is through the pupil accommodation review that parents and guardians communicate to the school board their perspective on the educational needs of their children and their views on the board’s specific proposal for change. Why do school boards consolidate and close schools? What do school boards consider before proposing school closures and/or consolidations? How does a pupil accommodation review work? What happens after a pupil accommodation review is completed? The range of programming and courses available. The availability of specialized support services for individual students or small groups. Specialized facilities, such as gyms, libraries, design and technology, music and science rooms. Sufficient enrolment to support sports teams and other extracurricular activities. A school building in better condition than the one that is to close. Accessibility features with respect to entry, movement within the facility and outdoor play space. School boards across Ontario have always opened new schools and closed older schools where the population of students has shifted. This is a reflection of the cycle of economic growth or decline and demographic change within communities. If school boards are to deliver high quality education programs and services to their students, they must respond and adjust to such changes. The Ministry of Education funds education in Ontario and works in partnership with local school boards to manage this change. Between 2003 and 2014, the number of students in Ontario schools declined by 152,000 due to a drop in the overall number of school-aged children. This is equivalent to 500 schools of 300 students each. In 2014, 57 of 72 school boards across the province experienced a decline in the number of students enrolled. To compound this challenge, declining enrolment was rarely distributed evenly across all schools of a board. Even boards that are experiencing overall enrolment growth may include neighbourhoods or communities experiencing declining enrolment. In the 2014-15 school year, 358 elementary and 205 secondary schools were less than half full. Since Ontario school boards are mainly funded on a per-student basis through grants from the Ministry of Education, boards, and therefore schools, lose funding as their enrolment declines. When funding decreases, all students in a board are affected because the cost of maintaining empty space is spread across all of the schools. When a school has excess space because of low enrolment, the excess space still costs money to staff, maintain and operate. One of the key responsibilities of school boards is to ensure that funding is focused on the students who are in classrooms, and not on maintaining empty classrooms. The board must make decisions about the best accommodation and program options for students relative to the funds that are available. School boards are responsible for providing their students with the best possible educational experience. Their job is to put the needs of students first. To maximize their investment in students, boards work to keep education funds focused on the classroom. Through their regular planning process, boards must ensure that students are being provided with appropriate programming and facilities. This requires that boards manage school space, including excess space, responsibly. The cost of excess space, and the reduced staffing which results from lower enrolment, may make it difficult to support a range of programs in each school building. The breadth and quality of programming available to students may be particularly challenging at the secondary level, but can also have consequences for elementary programs that require teacher specialists. Boards must develop a school accommodation strategy that takes their specific issues into consideration when ensuring how to best support program delivery, student achievement and well-being. To help keep education funds focused on student needs, school boards must manage the costs associated with empty space in schools. School boards use a variety of strategies to manage enrolment and space in their schools to help benefit students. These strategies may include making boundary changes to balance enrolment across a number of schools. When boundary changes are proposed, the school board will notify the parents and will hold information sessions. Another strategy available to school boards to manage excess space can involve bringing a tenant or partner into a school or a portion of a school, on a cost-recovery basis. The ministry has provided school boards with the Community Planning and Partnerships Guideline to ensure that school boards and community organizations exchange information about their current and future needs and opportunities. The Community Planning and Partnerships Guideline requires school boards to develop a board-approved local policy and to hold an annual meeting with local municipalities and community organizations. This annual meeting is an opportunity for the board to present information associated with the management of excess space and their projected future needs. School boards across the province have partners in their schools, such as child care agencies, Early Years Centres, settlement services and district health units, to name a few. As required in the Community Planning and Partnerships Guideline, school boards manage program needs for their students first, then they decide whether a school is eligible for further strategies such as facility partnerships. The objective of the Community Planning and Partnerships Guideline is consistent with the overall provincial direction on community hubs. In 2015, the Premier’s Community Hubs Framework Advisory Group released a report titled Community Hubs in Ontario: A Strategic Framework and Action Plan. This action plan brought renewed focus to the discussion of strategies to support the formation of community hubs across the province. The action plan encourages joint planning across government ministries and agencies, and highlights that in some cases, surplus school facilities can be ideal locations for the community to develop a community hub. Making school facilities available for the community to develop hubs is supported by school boards’ community planning and partnerships policies, the Community Planning and Partnerships Guideline, and school boards’ process for the lease or sale of surplus assets. Across all of these considerations, school boards manage program needs first, then they identify the school’s eligibility for other options such as facility partnerships or hubs. Another option for managing excess space is the possibility of a school closure or consolidation. This option is considered through a pupil accommodation review. When this is the case, school boards will generally indicate that other strategies, such as those listed above, have been considered for a school or group of schools but found to be not viable. Prior to making their final decision, boards consider the proposed solution from the staff of the board, as well as feedback from parents and the community. Consolidation is the combination of the student populations of two or more schools into an existing, or new structure. It may mean different groupings of students than in the existing schools. For instance, the organization might be grades JK-6, or 7-12 or K-12. The deciding factor would be meeting student needs. The school board must decide which strategy would best manage the changing circumstances of its schools. The responsibility of the Board of Trustees is to ensure that the educational needs of their students are met before other options such as facility partnerships are considered. If you wish to know more about your local school board’s planning processes, or its community planning and partnership policy, check out its website. If an accommodation review has started in your community, you may also find information about the management of excess space in the initial staff report presented to the board before it made the decision to review student accommodations. This report should be on your board’s website. Every board must develop and approve its own pupil accommodation review policy. The Ministry of Education provides a framework called the Pupil Accommodation Review Guideline to assist boards in the design of their local policy and process. The intent of the guideline is to ensure that, across the province, school boards’ pupil accommodation review policies and processes have the same minimum standards. The guideline is posted on the Ministry of Education’s website and on local school boards’ websites. Step 1: An initial staff report, including specific enrolment, program and accommodation issues, with a recommendation, is presented to the Board of Trustees. Step 2: The Board of Trustees authorizes a pupil accommodation review (public consultation) on the staff report and its recommendation. Step 3: The community is notified that a consultation will take place. Step 4: The community consultation process is undertaken. Step 5: A final staff report and recommendation are provided to the Board of Trustees. The staff final report must include community feedback. Step 6: The public provides comments directly to the Board of Trustees through public delegations. Step 7: A final decision is made by the Board of Trustees. Step 8: A transition process is outlined for the school consolidation or closure and the relocation of students. To allow school boards to adjust to local circumstances, the Ministry of Education’s Pupil Accommodation Review Guideline outlines two forms for the consultation process that may be undertaken. School boards may select a standard (longer) or modified (shorter) form of the pupil accommodation review process depending on specific local circumstances. In both the standard and the modified accommodation review processes, the Board of Trustees is responsible for receiving the final report, hearing public delegations and making the final decision. 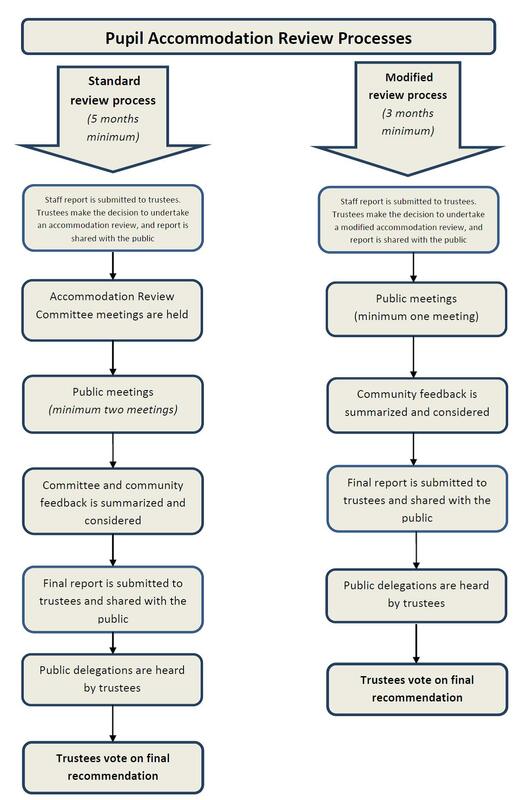 In the standard pupil accommodation review process, at least two public meetings are held. The standard review process runs for a minimum of five months from the time that the review is authorized by the Board of Trustees. Under the standard review process, an Accommodation Review Committee (often called an “ARC”) is appointed. It must include parent and guardian representatives from the schools under review. The board will provide the Accommodation Review Committee with clear Terms of Reference on the committee’s mandate, role, responsibilities and procedures. This committee may meet throughout the review process. The modified pupil accommodation review is a shorter consultation process which school boards may choose to follow. The modified process requires a minimum of one public meeting. The process must run for at least three months from the time it is authorized by the Board of Trustees. The appointment of an Accommodation Review Committee is not required. Parents and members of the public may become involved through the public meeting and the board’s public delegation process (i.e. where individuals can address the Board of Trustees). The modified pupil accommodation review process may be selected when the school board is faced with less complex options for the schools under review and when specific locally-determined criteria are met. School boards must clearly define the situations where a modified pupil accommodation review is possible in their local accommodation review policy. View your school board’s website to find out about the accommodation review schedule and the location of any upcoming meetings. Parents and all members of the public may attend the public meetings during an accommodation review. If you would like to be a member of an accommodation review committee (in the standard review process), contact your school’s parent council for information. Once an accommodation review has commenced, inform yourself about the proposed changes by reviewing the staff report to your Board of Trustees. Inform yourself about your board’s accommodation review policy (see your board’s website).The policy will outline the steps involved in the review process and will describe the various ways that your Board of Trustees receive public and community input to assist in making their decision. When the committee meetings phase of the review process ends, check your board’s website for the dates for public delegations. Public delegations are opportunities for members of the public to speak directly to the Board of Trustees during a public meeting. In a pupil accommodation review process, board staff share detailed reports on a group of schools with parents and the community. All parents and members of the public may access this information on the school board’s website and by attending public meetings. You will be informed of the objectives and details of the staff proposal. You may identify and communicate your interests and concerns regarding any proposed changes prior to a final decision being made by the Board of Trustees. Feedback on the proposal, and your opinion on the effect of the proposed changes on students, being given to board staff while they develop their final recommendation to the Board of Trustees. Feedback on the proposed changes being submitted, along with the staff report, to the Board of Trustees. Improved understanding in some detail the proposed changes to the schools and school programs once a decision is made by the Board of Trustees. The pupil accommodation review is the opportunity for you, as parents and community members, to provide feedback to the school board about the accommodation proposal. It is the chance to discuss which aspects of the accommodation recommendation matter most, and which aspects will best support student achievement and well-being. Opportunities for input will be different depending on whether the board has chosen the standard review process or the modified review process. School board staff are available to help parents and community members understand the proposal throughout the accommodation review process. The Accommodation Review Committee will serve as a conduit for the school community to communicate with the board. The Accommodation Review Committee will receive from board staff the initial staff report and the School Information Profiles, which will also be posted on the board’s website. School Information Profiles can enable an informed discussion of the current programs available to students and the potential for improved programming to support student learning. Public meetings will also inform the discussion. Board staff will ensure that the feedback provided by the Accommodation Review Committee and community members is gathered and shared with the Board of Trustees. The board will also provide an opportunity for feedback on the final recommendation through its public delegations process (i.e. where individuals can address the Board of Trustees). The Board of Trustees is responsible for the final decision. The initial staff report to the board, which will outline the reasons for using the modified review process, will be available to parents and the community and will be posted on the board’s website. A public meeting will provide an opportunity for parents to discuss and comment on the board’s proposed options for school programs and student accommodation. Feedback from the public consultation will be contained in the final staff report to the board. The board will also provide an opportunity for feedback on the final recommendation through its public delegation process (i.e. where individuals can address the Board of Trustees). The Board of Trustees is responsible for the final decision. When the decision is made to close a school, students must be transferred to a different school. School boards want students to feel welcome at their receiving school, and they develop a transition plan to make the move to a different school culture as smooth as possible. The transition plan organizes the transfer of students, program materials, equipment and school memorabilia from the closing school to the receiving school or schools. The transition plan will typically include opportunities for students and parents from all of the consolidating schools to come together, prior to the consolidation, to engage in activities aimed at generating interest in the change and building a renewed sense of community. This stage can be full of new opportunities for students. The transition process is generally planned in consultation with parents and staff. If you are a parent or guardian and your child attends a school that will consolidate or close, you may inform yourself about the transition process by contacting your school or school board. You may also be interested in reading the School Consolidation Experience Studies undertaken by the Ministry of Education that provide insights into the challenges and benefits of consolidations. If participants believe that a given pupil accommodation review did not comply with the board's policy, they may submit a formal request to the Ministry of Education for an administrative review of the process. Administrative review requests are considered by the ministry and may be granted if serious deficiencies have been identified and substantiated. The administrative review is not an assessment of the Board of Trustees’ decision, but of whether the school board’s process followed its pupil accommodation review policy. The report from the administrative review cannot overturn a school board’s decision. The reviewer’s report is given to the Minister of Education who shares it with the Board of Trustees and with the public. It is the Board of Trustees that decides how to proceed in light of the review. Additional information about the administrative review process may be found on your school board’s website or the Ministry’s website. Should a school board decide that a closed school is no longer needed for the purposes of the board, the facility can be declared “surplus to the needs of the board.” School boards can then proceed to lease or sell the surplus property to other organizations, according to the process required in the Education Act. In an effort to encourage public properties to remain in the public sphere, school boards are required to first offer their properties to other public sector organizations in priority order (which includes other school boards, municipalities and other levels of government). If the surplus property is not leased or purchased by the public sector, then the property may be offered on the open market. If you have further questions about the pupil accommodation review process, please contact your school board. Note: This document is for information and discussion purposes only. Formal instructions are available through the policies approved by individual school boards. 1. Throughout this document the term “parents” refers to both parents and legal guardians.